Mechanical failures have often inadvertently shaped art history. Jackson Pollock’s fatal car crash in 1956 and Pino Pascali’s death in a motorcycle accident in 1968 immortalised the two artists. When Joseph Beuys’s Stuka plane crashed in the Crimea in 1944, he survived. A group of nomadic Tartars found him and wrapped him in fat and felt to keep him warm. It was a story that not only defined the source of his artistic materials, but also one that became an integral and enduring part of Beuys’s legend. However, the creation of a personal mythology is not without its dangers. One of the most melancholic images in the history of modern art is the Joseph Beuys two-part multiple Enterprise 1973. The right-hand section is a photograph set in a metal box that shows the artist and his three children at home watching an episode of Star Trek on TV. The room is bare: they could be in any nondescript American motel. Despite that, they look relaxed and comfortable – except Beuys, who sits uneasily behind them, his gaze not fixed on the TV, his thoughts elsewhere, perhaps ruminating on how the future would judge his own contribution to the world. Even after his death in 1986, at the age of 64, Beuys remains an influential and complicated figure. He used the framework of artistic practice to build a style that mixed politics, anthropology and Celtic and Christian mythology, through which he presented a loose philosophy manifested in his many installations, performances, lectures and sculptures. As a result, by the end of his career he emerged as an activist, a ‘social sculptor’ intent on sociopolitical reform. His methods were never conventional. The most poignant example of this was his work as a political activist. He was involved in establishing the German Student Party in 1967 and later, with Joschka Fisher, the Green Party. Both groups were very active and highly visible, and in line with this Beuys felt the need to construct a powerful aesthetic around his actions and his performances, so that they would be remembered – a sensibility that he wanted people to regard as almost spiritual in nature. He believed he could single-handedly change the world, as well as influence the entire future of art. Over the decades, Beuys’s ‘religion’ and his political goals never had the impact he would have wished. But his approach to art did have an effect. Breaking the boundaries of artistic practice, he allowed a more fluid definition of what an artist was and what an artist did. Today, a wide number of artists, working in a variety of ways, have inherited – if that is possible – aspects of the Beuys sensibility, though in each case for very different ends. While Hirschhorn’s stance works as a form of social participation, Maurizio Cattelan upturns the Beuys myth of the artist shaman and plays games with his legacy. The clearest example is Cattelan’s sculpture La rivoluzione siamo (We Are the Revolution) of 2000, in which a cast of himself, wearing a shrunken grey, felt suit, hangs from a coat hanger. It is a simple and witty reference to one of Beuys’s iconic works – Felt Suit 1970. Cattelan’s suit sad-looking figure suggests, somewhat contentiously, that Beuys has become a footnote in art history. 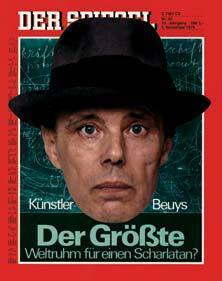 Beuys’s ambition to play a larger role in society is seen by Cattelan, and many of his colleagues, as delusional. As director and screenplay writer David Mamet suggested, art cannot really change the world, but it can prompt you to think about the world from a different angle, which, once you step out of the fiction of art, may help to make some changes in your life and eventually to the world. That’s a view today’s artists seem to share, which is perhaps why Beuys appears more as a conservative character than an innovative one: a born-again artist, we could say; someone who trusts only his own strong interpretation of his faith and his language, and holds on to the notion that his art could and would directly change the world. Cattelan has made a career out of lampooning the behaviour of the art world, and his work thrives on account of his humour – in this case, at the expense of Beuys. In contrast, Beuys was a serious artist, who took himself very seriously, and whose work (unlike that of his contemporary Marcel Broodthaers) certainly lacked a sense of humour. 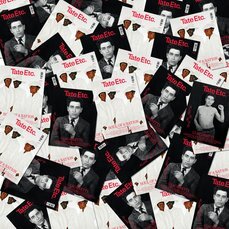 He concentrated, perhaps too much, on spreading his word and on his Salvation Army-like strategy within an art world that in the 1970s was crippled by political schizophrenia. And his relentless self-promotion and determined politicisation of his words and actions became inseparable. For Beuys, the politics surrounding his work were much more clearly designated and driven by the difficulties inherent in post-war Germany. When Beuys was alive, there was a belief that people could change things. He believed, somewhat paradoxically, in the idea that ‘everybody is an artist’, while his art was a one-man show. Succeeding generations have been very careful to clarify their positions as artists. For example, Rirkrit Tiravanija and Gabriel Orozco (both of whom have borrowed his focus on the active involvement of the viewer) are very clear in their minds that their role in society is one of an artist not political activist. Beuys knew that he was an artist (and in some ways a very conventional one), who used his materials in a very classical way. Yet he understood, ahead of time, that the political storm and social transformation that arrived with the 1960s student revolutions would not have allowed him to play the artist any longer. 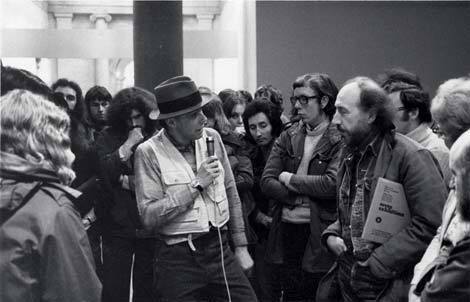 As a member of an elite – the art world – Beuys did not see any possible survival in a political mood that was going to crush any kind of elite, be it economic, political, or religious. In a proactive move, he transformed himself into something else: a creative conman, a visual preacher, a political candidate – whatever was necessary to cross that moment in history and to emerge with a charismatic aura. And he succeeded by disguising himself as a man of economics. Under his new persona he tried to theorise an economic system by which to regulate the world through art. He knew it was not possible, but in the 1970s, an age delusionally attempting to subvert the economic rules of the Western game, he understood that he could utilise his gimmicks to perform an ambiguous role within his own defined community. It is questionable whether any artist today could try the same approach – particularly the political preaching – without being ridiculed. And his physical appearance – the trademark hat, the fishing waistcoat – now looks like part of a strategy that belongs in the past. Integrating with the rest of society is now a better way for artists to infiltrate the communication channels, open up a dialogue and define their identity through the specificity of their artistic language. The Polish artist Pawel Althamer, who we could name as a Beuys of the twenty-first century, has diluted the heroic and epic mood of Beuys’s days. A sculptor, performance and action artist and creator of installations and video art, he reflects upon the role and place of art, in particular in large cities. Himself a resident of a vast housing block in the Bródno district of Warsaw, he observed, collected and documented examples of the spontaneous artistic activities of his neighbours. He has also organised projects in co-operation with them, including the action Bródno 2000, during which the people living at 13 Krasnobrodzka Street created a vast ‘2000’ sign by turning on lights in specific windows. If Beuys’s ambition was to move through the darkness of life with a full-blown torch, today’s artists, such as Althamer, seem to be more interested in looking into the simple, but mysterious corners of daily life with the help of just a light bulb. Beuys’s spectacular myth-making addressed a powerfully charged historical moment. He showed great contempt towards post-war Germany’s concentration on monetary recovery by adopting an artistic language of signs and symbols, characterised by his deliberate use of earthy, organic materials, including fat, felt, coal, olive oil and blood. He used these with precision to give grave symbolic meaning to his many vitrine installations and actions – and to provide his art with an enduring and immediately recognisable signature for which he would be remembered. If there is one artist today who embraces Beuys’s love of myth and symbols, then it is Matthew Barney. In his cycle of films, the Cremaster series, he creates a parallel world of signs and actions, with a myriad of seemingly unconnected events taking place in strange, architecturally spectacular and surreal environments. As with Beuys, there is a strong focus on the physicality of the materials, often unspecified – such as the seeping white liquid mess (perhaps a descendent of Beuys’s fat?) that one of the protagonists finds himself stuck in. But Barney’s personal mythology is so opaque that we are not given any clues as to where he is going with his imagery. While Beuys deliberately ensured his art had the aura of a shrine, Barney uses the moving image to keep his work away from any semblance of reality. The public role that Beuys played in his life seems less effective as a way of working in the twenty-first century. He liked the action and the polemics. He liked gigantic projects. His 7000 Oaks in 1982 at documenta 7, for example, took five years to complete, and saw him planning and implementing the planting of 7,000 trees, each paired with a columnar basalt stone throughout the city of Kassel. He intended this to be the first stage in an ongoing scheme of tree planting to extend across the world, as part of a global mission to effect environmental and social change. Many of today’s artists seem more tame, if no less convinced that their role in society is as seminal and pivotal as that of their predecessor. They are more likely to respond with a symphony of whispers, a concert of hushed proclamations. 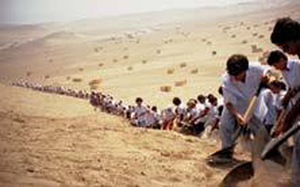 Francis Alÿs’s Peruvian project When Faith Moves Mountains 2002, in which 500 people supplied with shovels moved a 1,600ft long sand dune four inches from its original position, was the kind of work, however grand in scale, that didn’t necessarily demand that anyone actually witness it. Beuys’s sense of the physical belongs more to a modern sensibility than to a contemporary one. He is maybe the last member of a Brancusian family tree, rather than the first in a contemporary art lineage. The energy he talked about was that burned by the body in order to survive the effort of living. The Italian student movement of the time called for the harnessing of the power of the imagination, but that was never really an option for Beuys. Now artists such as Carsten Höller, Olafur Eliasson, Suchan Kinoshita or Koo Jeong-a have learned they cannot rely on the physical experience of our reality, and have chosen to search for the alternative energy of the mind, soul and feelings; to activate the power of our imagination to survive and succeed, maybe not in the Caucasian tundra, but more safely and peacefully in our no less uncertain times. When I first came across Joseph Beuys’s work, I thought it was impenetrable, because I was looking for something specific. But to fetishise his work, to see it as relics, seems like a sin to me, considering that’s not where his primary activity was. He was a polymath, who was interested in everything from language to physical energy systems. He saw the world as one homogeneous soup, one big whole through which we have to navigate the most compassionate route. Ultimately, I think an artist can do no more than that. He had a primitive view of being an artist, in that he was a shaman, a visionary. He was the same person who would walk in and say: ‘We need to build a huge new church in this clearing, so we need to invent a new type of buttress, so we can get a massive spire.’ It is nutters like that who can change society. The idea that things are both real and symbolic, while part of a wider system, and that all that thought and action has a consequence, is the best form of consciousness to assume. Although I may fumble in my steps, that is what I try to do. I’m trying to look at a wider picture. When people criticise my work, it’s usually because they want to see some beautiful painting or amazing sculpture, but really all my work is a signpost to something else. So I have a lot of time for Beuys in that respect. He called society a ‘sculptural structure’, one that needs healing from itself. He was trying to cause a change and give a gift back to his fellowman through the action of a lecture or an artwork. I do find some of it problematic though, such as the deep mythology he invented, which becomes more of an adoration of the freakish than being a truly communicative vehicle. Then again, it was necessary because he was trying to tap into something essential. I realise it’s a nebulous idea. Marina Warner got it just right when she was contrasting Warhol and Beuys. She said: ‘While Andy Warhol copied things, saying he wanted to be like a machine, Beuys intervened, communicated his dreams, and wanted to change the world.’ But for some reason the art world seems to have taken the other path, the Pop art Warhol path, just reflecting back culture’s mechanics, and not questioning them, not talking about them, not investing them with any power, choosing instead to act in irony and with cynicism, and using those things to instigate change. But those things don’t produce change; they are just a narcissistic response to culture. Beuys, on the other hand, no matter how bizarre his methodology, was essentially a positive artist, which is interesting when you remember that, at the time when he was working, people were extremely jaded – what with the Second World War and Vietnam. He didn’t have an optimistic environment in which to act: people looked to the empowerment of the 1960s and the failure of the associated movements, and thought that there was no point. The notion that he believed his actions and those of any one man could transform the world is a misreading of him. His was not the idea of an individual Übermensch striding out into the landscape. He understood that the activity he was contributing was catalytic. It required everybody to make changes. He offered the possibilities, and tried to do it in the most expansive way. He understood that it had to be an integrated, group effort.